Halloween is about tricks and treats. The treats usually take the spotlight, but it is always fun to have a trick thrown into the mix once in a while to keep Halloween fun and not completely sugar-coated. These Creepy Cups Halloween Coffee Mugs deliver a little trick with your morning cup of coffee. 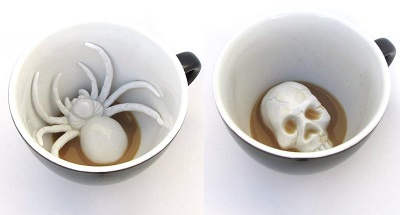 The Spider Mug and the Skull Mug both have a spooky surprise that is revealed as you drink that cup of coffee down. One has a menacing looking skull that will stare right back at you, and the other has a creepy spider that looks like it could crawl right over the rim of your mug. The best part of these mugs is that they look completely normal from the outside when they’re filled up, so you can serve coffee in them to unsuspecting targets (who, hopefully, can take a joke!) for a little Halloween fun.